I’ve got a tip about new software called MakeMe3D that can do automatic 2D to 3D video conversions, so I’ve decided to do a quick test and share my experience, so you will know what to expect from it. The software is being developed by a German company called Engelmann Media, who are apparently specialized in the production of audio/video-related software tools. MakeMe3D is a commercial software, but you can try it out for 3 days + 7 more if you request a free key (limited to 5 minutes of video to convert). What the software does however is pretty much the same as what the free Avisynth 2D to 3D conversion script we have here, but packaged in a nice and user friendly interface (kind of)… by that I mean the use of a frame offset (1-2 frames) and frame geometry transformation to achieve the simulated 3D effect. 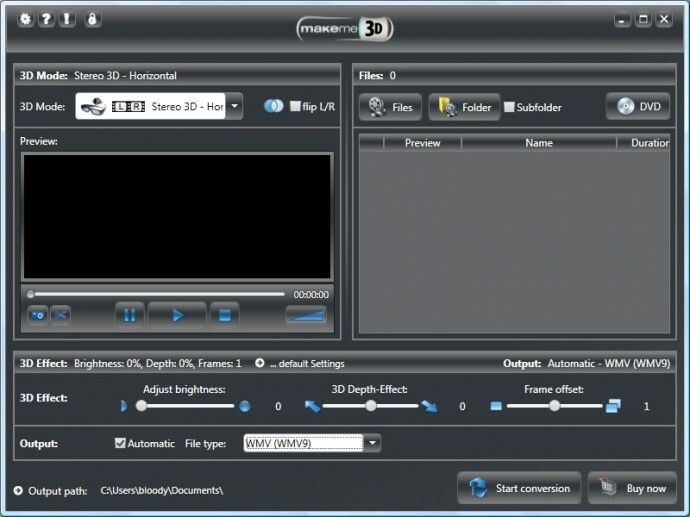 This however is not the problem, it is lets say the easier approach to go for real-time conversion, although the idea of that software is to convert the video and save a file. There is a live preview, but that live preview is not very useful for most formats anyway and the preview seems a bit buggy… I got a lot of .NET errors while testing it. Then again I also had some trouble converting some common video files and formats, the conversion process just did not want to start or it appeared to have started, but nothing was happening and the software remained at its conversion status windows without moving at all (mostly with MP4 input files). Another issue I’ve experienced is related to the output methods supported, for example the automatic output does not produce satisfactory results for high resolution videos (poor quality) and if you decide to go for manual mode you kind of get only low quality and resolution modes available. So apparently the software was not designed to be used with high-quality 720p and 1080p source material in order to also output high-resolution and quality 3D converted videos. In the end I can say that I’m quite disappointed from my quick test of the MakeMe3D software and considering the fact that the authors are selling the software at this stage for EUR 34.99 or around $50 USD, I would not consider buying it at all! Of course should you be interested in the software, you are more welcome to try it out yourself, so below you can find a download link from the official FTP server. I think these software just like those in recent TVs who convert 2D in 3D are just a waste of time… unless using level maps (and even in such case results are often unsatisfactory) there is no way to correctly detect depth in images. I could not get this to work, I kept thinking i was being stupid, but i had several different formats on my desktop (nothing odd) and I could not seem to start anything. Looked at some stuff on youtube and didn’t see any real difference TBH. worked great for me, have been trying to find a way to do films quickly and this worked great in blue/yellow anaglyph for colorcode….the previous way I was doing was splitting the movies into jpegs and converting them individually with the colorcode 3d software and then repackaging the files into an avi, as you can imagine this was extremely time consuming, (days and weeks of boring work as no batch scripts were useable) and in the end this software did it just as well for me, no complaints at all for a quick and easy process…..
any conversion of 2d to 3d is going to be substandard compared to dedicated 3d filming, but it does the job as well as anything I have found! The converted file wouldn’t play on the tv. Couldn’t get the file to play in MPC or VLC. It did play on the windows media player but the quality was the worst iv’e ever got from a 3D converter (and i’ve tried 5 different ones do far). Will not ask for a refund, have written this critcism of it instead.